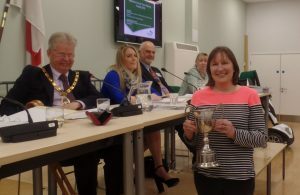 Julie Coates, manager of the Hailsham Foodbank project, has been recognised as a “Hailsham hero” for her dedication to local community life and passion to help those in need. Town Mayor Councillor Nigel Coltman presented Mrs Coates with the Hailsham Hero Community Award at the Annual Town Meeting held at the Hailsham Civic Community Hall yesterday evening [10 April]. Mrs Coates, a resident of Hailsham for 14 years, currently manages the local Foodbank on behalf of the Crosslink Trust, which provides emergency food to people in crisis who are referred to them by the caring agencies. All food is donated by the community. The Hailsham Hero Community Award was set up by the Town Council to recognise those people who have achieved great things for the local community, committed a single act of bravery, heroism or selflessness, or has gone above and beyond what is expected of them to make things happen.